In 2011, the team moved from semi-regular football to a structured 11-a-side team which joined the Scottish Unity Football League. The Club has raised lots of interest in Glasgow and beyond since 2011 and results have improved on and off the park since. During 2012 the The Club also received funding from Sported, the leading UK sport for development charity, and in 2013, received funding from the Big Lottery Fund's Young Start Fund and Awards For All funds to create community projects in Glasgow. ‘Kick Off Together’ with United Glasgow Football Club brought together 60 participants from a variety of disadvantaged groups to offer them opportunities they may otherwise have been denied through sports sessions, first aid and coaching qualifications and a college access qualification. We also developed the United Glasgow Communities Cup and a "play for a pound" 7-a-side league which aimed to remove the barriers to semi-competitive football for individuals who were not active. The largest growth in 2014 was the rapid progression of our women's football who moved from a group in the Kick Off Together programme and an informal drop-in session to joining the Scottish Women's Football League in March 2015. Additionally, a second men's team was added to the Club in September 2014. The men's teams left the Scottish Unity Football League in the summer of 2015 with our first team moving to playing on Saturdays in the West of Scotland Amateur Football League and our second team joining the newly founded Glasgow Community & Co-operative League, along with the new men's development team. While the Men's Saturday Team (and the West of Scotland Amateur Football League) folded, the club added additional drop-in sessions in 2017 to complement the existing provision, opening football opportunities to more people than ever. While we have already worked with hundreds of young people in Glasgow, we hope the project will continue to grow - incorporating more community education and inclusion projects in partnership with other organisations - and result in a true community football club which represents all of Glasgow; regardless of background or financial position. We have been successful in the provision of football but also in the creation of a space where people are able to mix without feeling like outsiders, using football as an international language. We're proud to provide a space that is welcoming and inclusive, and have created an education and campaigning arm to the club to this effect, as well as encouraging players to train and play with respect of their teammates, officials and opponents. United Glasgow Football Club is engaged in many networks for inclusion in football, in the UK and across Europe. 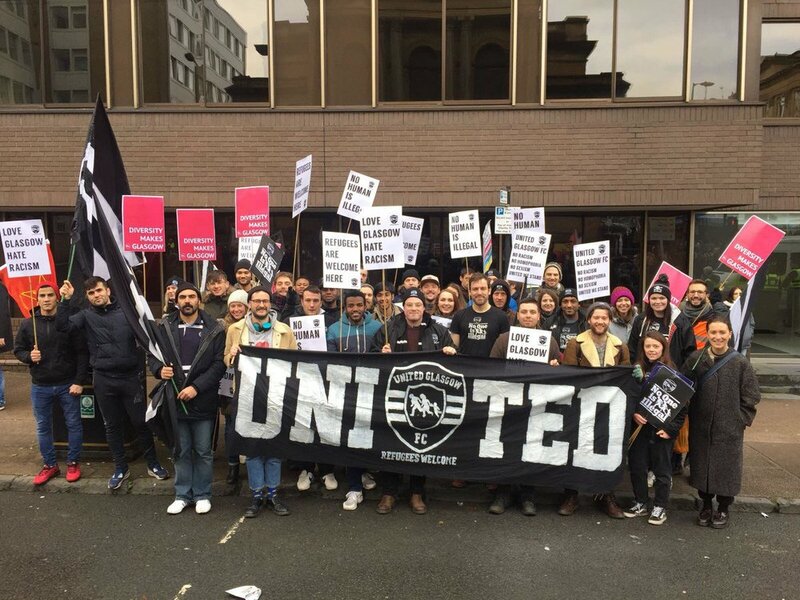 We're active members of the Football Supporters Europe Anti-Discrimination Division, participants in the Mondiali Antirazzisti in Italy and partners of Show Racism the Red Card, Football V Homophobia and others.